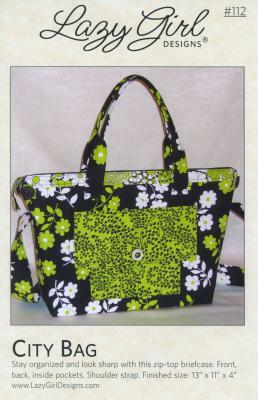 Use Lazy Girl's City Bag pattern to make your perfect satchel/briefcase or purse. The City Bag design features a ton of pockets, it's fully lined, and has handles plus a shoulder strap. Use any standard zipper & find out how easy it is to put a zipper in using Lazy Girl's trademark 'No-Fear' zipper installation technique. Finished measurements are approximately 11" x 17". Basic sewing & quilting skills required. For added stability, Bag-E-Bottom ( Size C) custom acrylic base is recommended to use in the bottom of your bag.